November 20, 2017 (Toronto, ON) – Michael Redhill has been named the winner of the $100,000 Scotiabank Giller Prize for his novel Bellevue Square, published by Doubleday Canada. 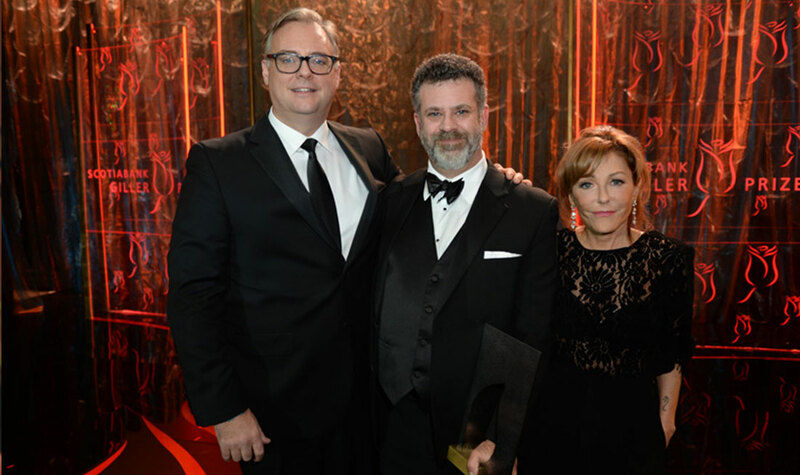 The announcement was made at a black-tie dinner and award ceremony hosted by Mary Walsh and attended by nearly 500 members of the publishing, media and arts communities. The gala was broadcast live on CBC, CBC Radio One and live-streamed on CBCBooks.ca. This year the Prize celebrates its 24th anniversary. Michael Redhill is a novelist, poet, playwright and former publisher of Brick. He is the author of the novels Consolation and Martin Sloane, which was a finalist for the 2001 Giller Prize; the short story collection Fidelity; and the poetry collection Light-Crossing; among other acclaimed works. He lives in Toronto. During the award ceremony, Canadian soprano Measha Brueggergosman performed a tribute to Jack Rabinovitch, founder of the Giller Prize who died in August. A roster of distinguished authors – Lawrence Hill, John Irving, Rupi Kaur, Thomas King and Madeleine Thien – introduced the shortlisted authors and presented video profiles highlighting the nominated books. Listen to CBC Radio’s q tomorrow at 10 a.m. ET for an interview with Michael Redhill and relive the gala at CBCBooks.ca. Ask the author your questions about his book during a live Twitter chat hosted by @GillerPrize on November 23 at 2:00 p.m. ET using the hashtag #GillerWinner. Audiobooks and audio entertainment launched Audible.ca, a dedicated service for Canadians which celebrates our country’s rich literary and theatrical tradition. The Scotiabank Giller Prize, founded in 1994, highlights the very best in Canadian fiction year after year. The Prize awards $100,000 annually to the author of the best Canadian novel or short story collection published in English, and $10,000 to each of the finalists. The award is named in honour of the late literary journalist Doris Giller by her husband Toronto businessman Jack Rabinovitch, who passed away suddenly in August 2017. Now in its 16th year, the Scotiabank Giller Light Bash is hosted nationwide in seven cities – Vancouver, Calgary, Regina, Winnipeg, Thunder Bay, Toronto and Halifax – in support of national literacy organization Frontier College. All proceeds support Frontier College and provide essential literacy programs for children, youth and adults in communities across Canada. For more information, please visit www.gillerlightbash.ca. Audible, Inc., an Amazon.com, Inc. subsidiary (NASDAQ:AMZN), is the leading provider of premium digital spoken audio content, offering customers a new way to enhance and enrich their lives every day. Audible was created to unleash the emotive music in language and the habituating power and utility of verbal expression. Audible content includes more than 300,000 audio programs from leading audiobook publishers, broadcasters, entertainers, magazine and newspaper publishers, and business information providers. Audible is also the provider of spoken-word audio products for Apple’s iTunes Store. A leading entertainment and media company, Cineplex (TSX:CGX) is a top-tier Canadian brand that operates in the Film Entertainment and Content, Amusement and Leisure, and Media sectors. As Canada’s largest and most innovative film exhibitor, Cineplex welcomes 75 million guests annually through its circuit of 163 theatres across the country. Cineplex also operates successful businesses in digital commerce (CineplexStore.com), food service, alternative programming (Cineplex Events), cinema media (Cineplex Media), digital place-based media (Cineplex Digital Media), amusement solutions (Player One Amusement Group) and an online eSports platform for competitive and passionate gamers (WorldGaming.com). Additionally, Cineplex operates a location based entertainment business through Canada’s newest destination for ‘Eats & Entertainment’ (The Rec Room), and will also be opening new complexes specially designed for teens and families (Playdium) as well as exciting new sports and entertainment venues in communities across the country (Topgolf). Cineplex is a joint venture partner in SCENE, Canada’s largest entertainment loyalty program.